Following up 2017’s impressive self-titled EP, BENTHIC REALM return with ‘We Will Not Bow‘. For those not in the know, BENTHIC REALM hail from Massachusetts and are led by none other than Krista van Guilder (vocals and guitar). Krista has a long-standing presence in the Massachusetts scene, as she has previously been a member of Dahlia’s Dead, Obsidian Halo, Warhorse, Lucubro, and Second Grave. When Second Grave called it a day in 2016, Krista formed BENTHIC REALM with Second Grave bassist, Maureen Murphy. Murphy’s history includes stints with The Forgotten, Dimentianon, and Negative Reaction. Joining them on ‘We Will Not Bow‘ is Conclave drummer, Dan Blomquist (replacing Brian Banfield on the kit for this release). “Save Us All” opens this four-track effort building on what they previously did with their EP ‘Benthic Realm‘. The introductory riff will have you grooving in no time, and it is not long before you get to hear Krista’s signature vocals, her voice fitting perfectly with their groove and doom sound. Short, catchy chorus on this one with a slowed down, dirty riff to end the track. And yes, as sung at the end of the track, BENTHIC REALM proves that they have certainly risen. Maureen and Dan shine on “Thousand Year Rain”, a doomier track that showcases each member’s talent. Great bass line on the intro, drums more up front in the mix. Dan providing some brilliant drum fills into the chorus. Krista delving into some great lyrical content to go along with their doom and groove sound. Surely a stand out track. 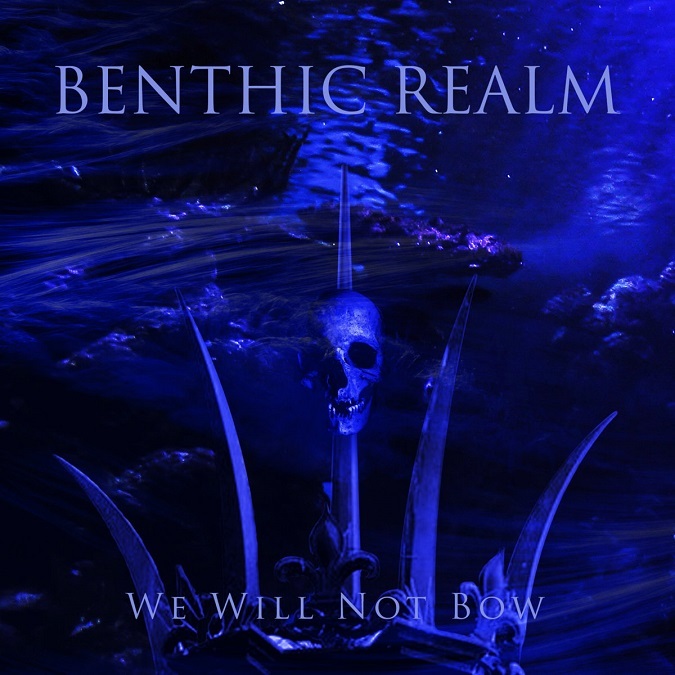 BENTHIC REALM unfurl their first instrumental with “I Will Not Bow.” All transitions are entrancing, smooth, and seamless. A song that just as easily could have worked with lyrics, however it works just as well without. I can see this one working great as a live jam. The ep ends with “Untethered” which, along with “Thousand Year Rain”, is another standout track. Much like “Where Serpents Dwell” ended their previous EP release on a high note, “Untethered” follows suit with a sea-themed, doom masterpiece. A much more personal and passionate message throughout. BENTHIC REALM showing their doomier tendencies here, as well, especially during the chorus. Great solo by Krista, only complaint is that it could have been longer, as I didn’t want that vibe to end. As their Bandcamp bio says, “Benthic Realm conjure melodies and crushing rhythms from the dark abyss.” It is refreshing to see a trio belt out no-nonsense songs, free of any stoner elements that are so prevalent these days. It’s a testament to the years of experience of their members. Looking forward to what’s to come from these guys. If it is anything like this, I’m sure we’re in for a great ride. 2019, Album Art, Album Review, Audio Stream, Bandcamp, Benthic Realm, Dan Blomquist, Doom, Festival, Heavy Rock, Krista van Guilder, Maryland Doom Fest, Massachusetts, Maureen Murphy, New England Stoner And Doom Festival, Review, Sludge, Streaming, The Maryland Doom Fest, Tour Dates, U.S.